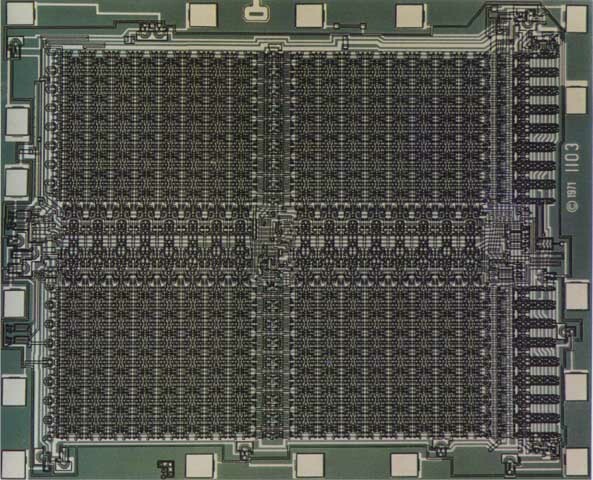 It takes about 300 billionths of a second to read or write a bit into the 1103. this chip has 1,024 memory cells (the small rectangular features) arrayed in four grids of thirty-two columns and an equal number of rows. The circuits in the horizontal spine decode the columns; those along the vertical spine, the rows. Actual size: 0.113 x 0.139 inches.